The tour is approximately 2.5 hours and is $150 for the three-vineyard tour. Longer custom tours are also available. 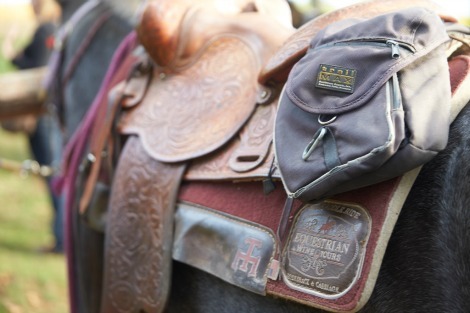 Owners Jake and Shirley Price, who started this operation 8 years ago, have a passion for Tennessee Walking Horses. Of the 30 Tennessee Walking Horses at Jake Price Stables, seven of them are rescue horses. They also offer horse-drawn carriage rides that are perfect for weddings, engagement parties, or other special occasions. Only an hour from Portland, Wine Country Farm Bed and Breakfast is a historic romantic getaway built in 1910. Located near the town of Dayton, the Inn offers lodging-starting at $150 per night-with spectacular views of the Willamette Valley and Cascade Mountains. The vines at this stunning estate, planted in 1970, are the second oldest in the area and include Pinot Noir, Chardonnay, Muller Thurgau and Riesling varietals. After introducing himself with a warm smile and friendly handshake, Price selected one of his Tennessee Walking Horses for each of us. Like a sommelier pairing a wine and meal, Price expertly pairs horse with rider. He says he can tell by a person’s swagger which horse is the right match. Before mounting our new equine friends, we were given a short but thorough safety lesson. The well-trained horses offer a comfortable ride through the famous Red Hills of Dundee, and all levels of riding experience are welcome. Price and his team led us on a private tour of some of the best vineyards in Yamhill County. We rode side-by-side through the lush vineyards listening to Price tell stories of past trail rides. Our first stop was White Rose Estate, which offers some of the most breathtaking vistas in the area. The tasting room is cozy and romantic, and guests are offered espresso in addition to a sampling of three superb varieties of pinot noir. After a leisurely stroll around the grounds, we returned to find our guides had braided lavender sprigs into each horse’s tail. 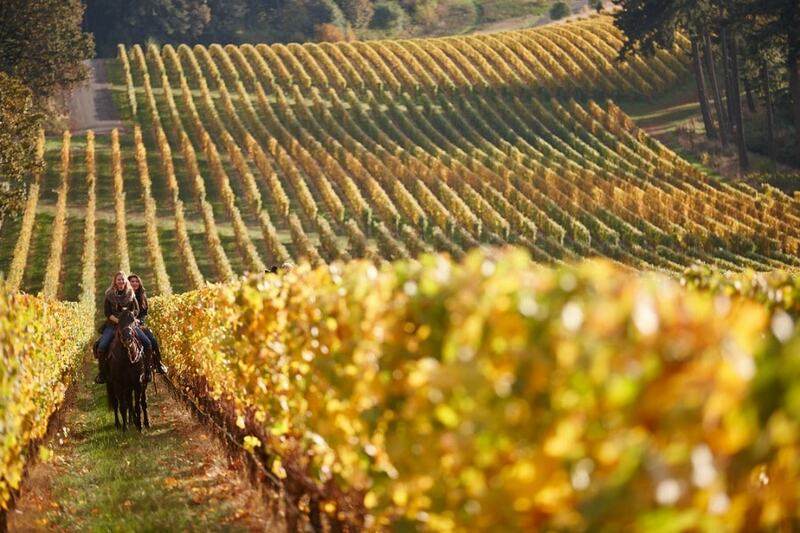 Our decorated mounts carried us on to Winter’s Hill Vineyard as the sun began to dip toward the horizon, cantering between the rows of vines and along the rolling hills and giving us a spectacular vantage point on the golden countryside. At Winter’s Hill Vineyard, which is larger and more rustic, we were treated to pairings of chocolate and smoked meats with our tasting, which included pinot gris, pinot noir, and port. We continued on to Vista Hills Vineyard and Winery, arriving just as the sun was setting. 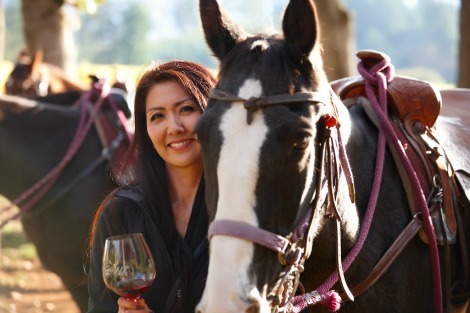 We sipped another flight of exquisite wines from inside the sophisticated tasting room, drifting outside to take in a spectacular view of the undulating vineyards from the adjacent elevated deck as our equine companions patiently waited under the oak grove. We couldn’t leave without taking a few more pictures as the sun gently set over the Dundee Hills. 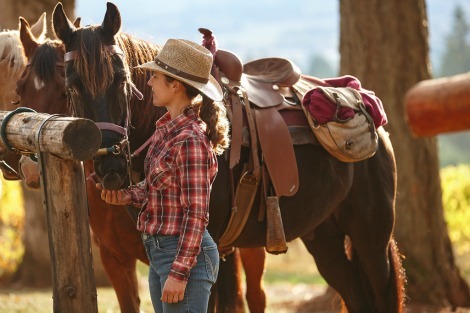 It’s best to wear jeans, boots, and layers for your equestrian adventure, since the weather can be a bit unpredictable in Oregon. Wine tasting fees are not included in the tour so be sure to carry along some cash or credit. 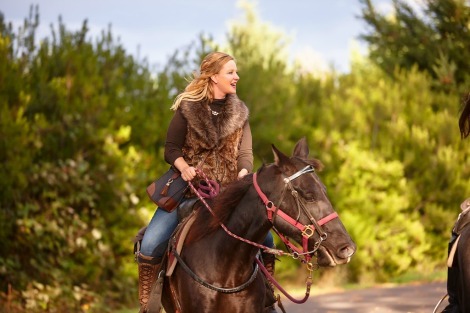 Each horse is also outfitted with a saddlebag, so should you be inspired to purchase that perfect bottle of wine for your next dinner party, there is ample space to carry it back. If you are interested in purchasing a case, some of the wineries will hand deliver your purchase to Wine Country Farm, your final destination (and most also offer shipping). Bigger items like raincoats will also fit into the saddlebags. After a lovely afternoon’s ride you might be interested in experiencing some fabulous Northwest cuisine. I’d recommend stopping at Red Hills Market in Dundee for a sampling of local goodness with a wide selection of cheeses, charcuterie, craft beer and wine. Owners Jody and Michelle love offering pairings of local artisan foods and wines. Another local favorite is The Jory, The Allison Inn and Spa’s signature restaurant located in Newberg. The Jory’s creative menus feature local garden-to-table agriculture and wine pairings. Less than an hour’s drive from Portland, The Allison Inn and Spa — accommodations starting at $380 — is a boutique hotel boasting views of snowcapped mountain ranges, rolling hillsides, working vineyards and agricultural farmlands. 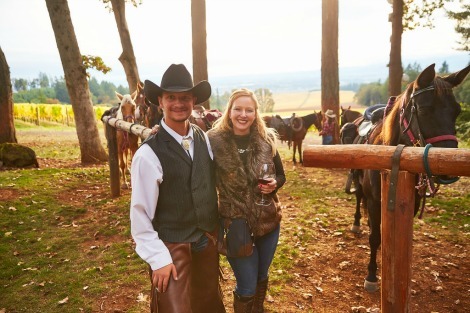 For an unforgettable experience, I recommend you ride and sip through Oregon Wine Country on Jake Price’s guided Equestrian Wine Tours. 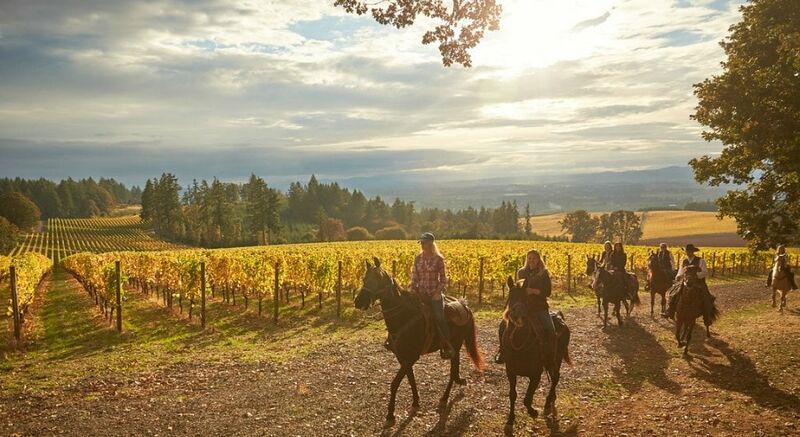 Not only will you enjoy breathtaking countryside as you wind your way between the vines, you will taste award winning wines at some of Yamhill Valley’s best wineries. 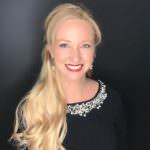 Sabrina Stoffregen is a global strategic communications manager and owner of Sabrina Stoffregen Inspired Designs. 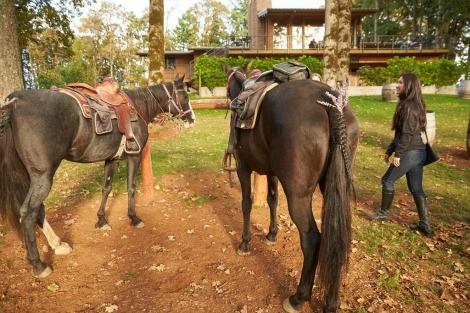 When she’s not dog mushing, wine touring or travel writing, she is out at the Willamette Valley Training barn with her family spending time with their 3-year-old twin Tennessee walking horses, Annabel and Oliver.